Markdown Edit is a Windows desktop CommonMark (a.k.a. 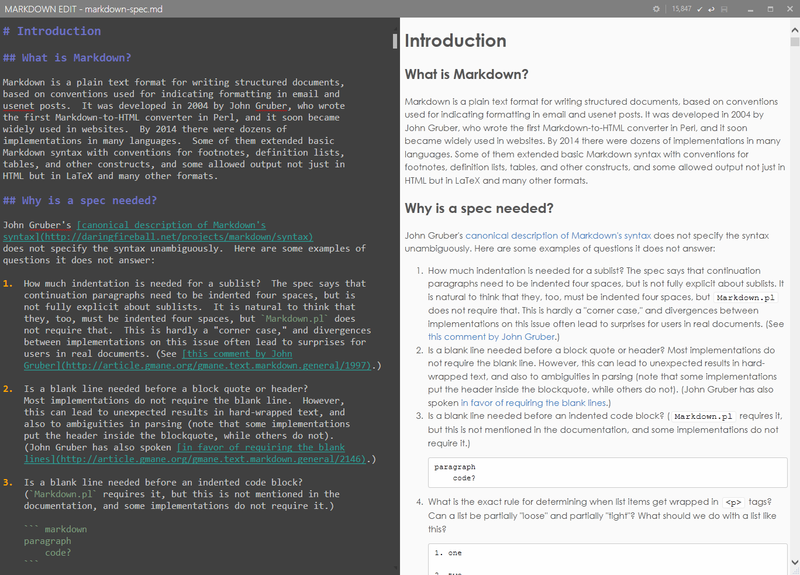 Markdown) editor with an emphasis on content and keyboard shortcuts. There is minimal window chrome and most functions are accessed through keyboard shortcuts. There is no main menu, status bar, tabbed windows or other distractions. Markdown Edit is ready for translations. Go here to find out how. I need themes! (Dammit Jim!) I’m a programmer, not a designer. Send me some cool themes and I’ll include them. Windows 7 - You’re welcome to install MDE on Windows 7 but it’s not supported. Some users have reported a font issue. The issue is cosmetic (some icons appear as blank squares). Read more and link to new font. Keyboard shortcuts for bold, italic, headers, lists, block quotes, etc. User defined snippets improve the speed and proficiency of writing documents. When Auto Save is enabled (Alt+S), content is saved whenever you pause typing for 4 or more seconds. User settings are stored in a text file in the AppData folder. Placing settings in a plain file allows sharing of settings on different installations. When you change settings and save this file, Markdown Edit will immediately update to reflect the changes. Colors can be defined as RBG values, like the EditorBackground setting, or using the predefined names (like the EditorForground setting). Acceptable predefined names are listed here. If you delete this file, Markdown Edit will restore it with the default settings. Snippets allow the quick insertion of words or phrases by typing a trigger word and then the TAB key. This can improve the speed and proficiency of writing documents. Snippets are stored in a text file that can be edited by pressing F6. Snippets are activated by typing the trigger word and pressing TAB. Where [TAB] is the tab key. Snippets can contain special keywords. If you delete this file, Markdown Edit will restore it with the default snippets. You can change the appearance of the preview view by changing the user template file. User templates work similar to user settings. The template file is stored in the AppData Folder as user_template.html. It can be quickly accessed by pressing F8. Edit it as you see fit. It is strongly recommended that you keep the IE9 meta tag in the <head> section. A <div> with an ID of contents is required. This is where the translated markup is inserted into the document. If you delete this file, Markdown Edit will restore the default template. Pressing F7 will toggle spell checking. Spell checking is done as you type. Right-click on the word to get suggested spellings or to add to the dictionary. The custom dictionary is a simple text file. It stored in the same folder as the user settings and user templates. It can be accessed and edited by pressing Shift+F7. Markdown Edit ships with dictionaries for many languages. Set the dictionary by pressing F9. The dictionaries are stored in the installation folder under Spell Check\Dictionaries. Markdown Edit has a rudimentary theme system. Themes, control the appearance of the editor and syntax highlighting. The UI elements (i.e. dialogs) are not affected. Out of the box, Markdown comes with several themes which can be accessed by pressing Ctrl+T. Selecting a theme updates your user settings. You can further edit the theme by opening your user settings (F9) and editing the theme section. This is the recommended way to create a new theme. Themes are located in the installation directory under \Themes. Syntax highlighting does not recognize multiple-line constructs. It uses regular expressions which don't understand the underlying Markdown constructs. I'm hoping as CommonMark matures that a syntax parser (like PEG) will emerge.